Spider-Man: Homecoming Prelude #1 is a very disappointing start for this tie-in. Marvel has a long history of tie-in comics related to the films, and sometimes they’re pretty essential reading. The Doctor Strange Prelude comics, for example, really fleshed out the mystical corner of the MCU – including giving us the backstory of Kaecilius, the villain. Unfortunately, though, this year’s preludes have been surprisingly tame. The Guardians of the Galaxy Vol. 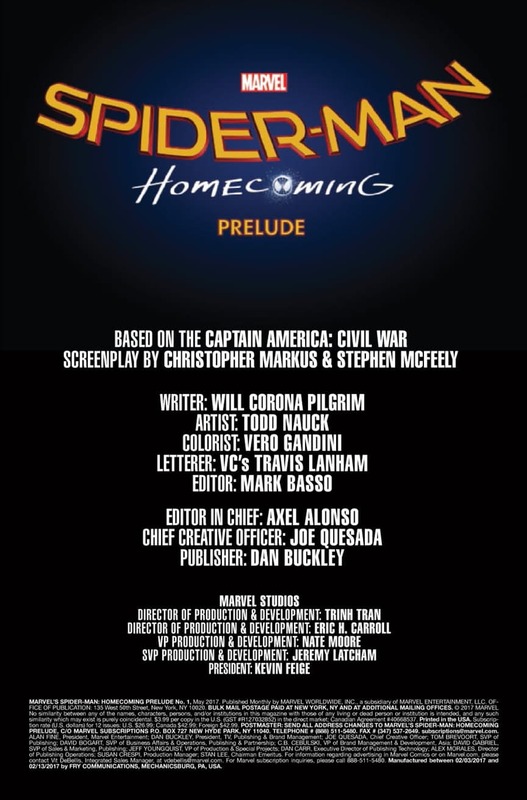 2 Prelude was nothing more than a comic book version of the first film, and the Spider-Man: Homecoming Prelude is more of the same. It’s hard not to see that as a missed opportunity. 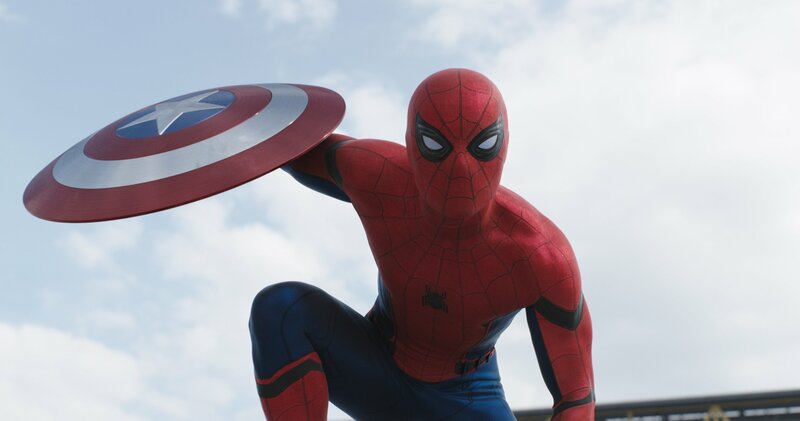 Marvel Studios has famously chosen to skip Spider-Man’s origin story for the upcoming movie, and instead reveal a youthful Spider-Man who’s already been web-slinging for the last six months or so. We’ve not seen any of the iconic Spider-moments so often repeated; we’ve not seen his first acts of heroism and we’ve barely had a taste of the ol’ Parker luck. 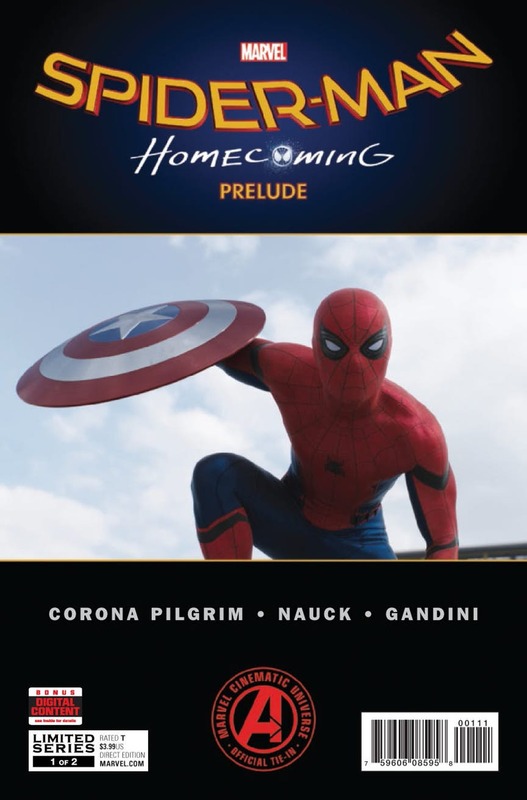 Instead of letting the prelude comic actually be a prelude, though, this tie-in comic is literally a Spider-centric adaptation of Captain America: Civil War. 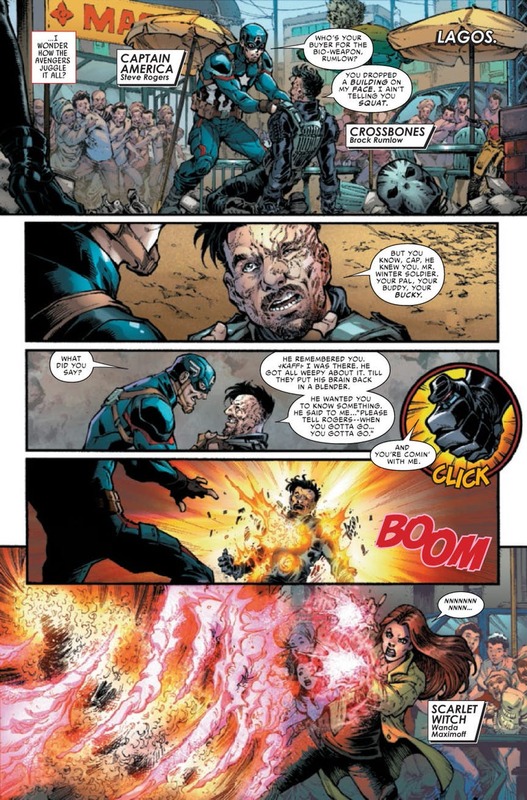 From there, though, the comic jumps back to the main plot of Civil War, showing Captain America confront Crossbones, while Tony Stark talks about his father. It’s immediately clear that Will Corona Pilgrim’s script is only going to adapt the highlights, meaning we don’t get to see Crossbones’s raid – we literally skip to Crossbones’s suicide. Sadly, doing this robs the scenes of any sense of drama. The problems continue in the comic’s main action scene, where we get a faithful reproduction of Bucky’s escape. With Captain America going on the run with Bucky, this is the inciting incident for the whole superhero ‘Civil War,’ so it makes sense to go into detail here; but it’s just not handled very well. The comic clearly assumes you’ve seen the film, and jumps between key moments with a dizzying speed. So much happens in between the panels, and as a result those scenes feel incomplete. Take, for example, Bucky’s getting into the helicopter. The first panel shows Bucky about to get in, Steve Rogers right behind him calling out his name. In the very next panel, the helicopter is in the air, Steve Rogers is gripping it with one hand and holding on to the helipad with the other. The whole sequence of events is rushed, and as a result is pretty unsatisfying. I understand what the comic is trying to do. 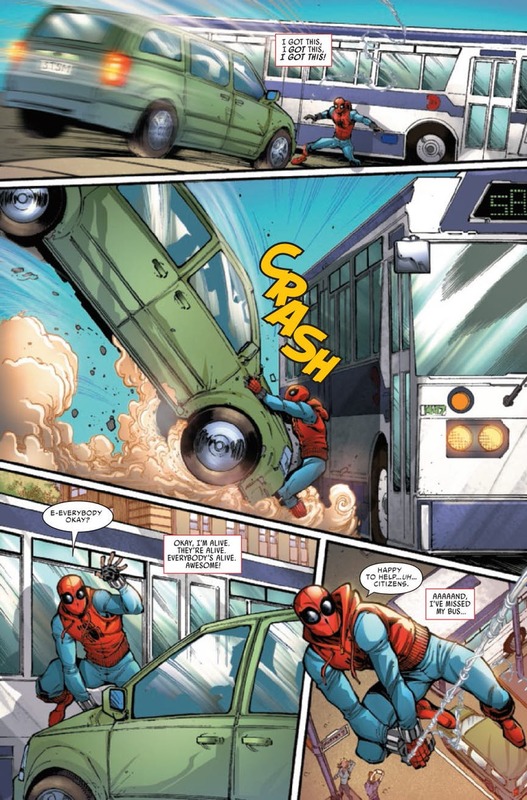 It’s trying to present Spider-Man as a bystander who gets drawn in. But unfortunately it depends too much on you having watched the film; an adaptation like this needs to have the strength to stand on its own two feet, not basically hand-waving away huge elements of the plot with the implication, “oh, go watch the film.” It’s not helped by Todd Nauck’s art, which is somehow lacking in any sense of dynamism. Where many of Marvel’s Prelude comics have been excellent and important to the development of the MCU, sadly I have to say that this one isn’t. 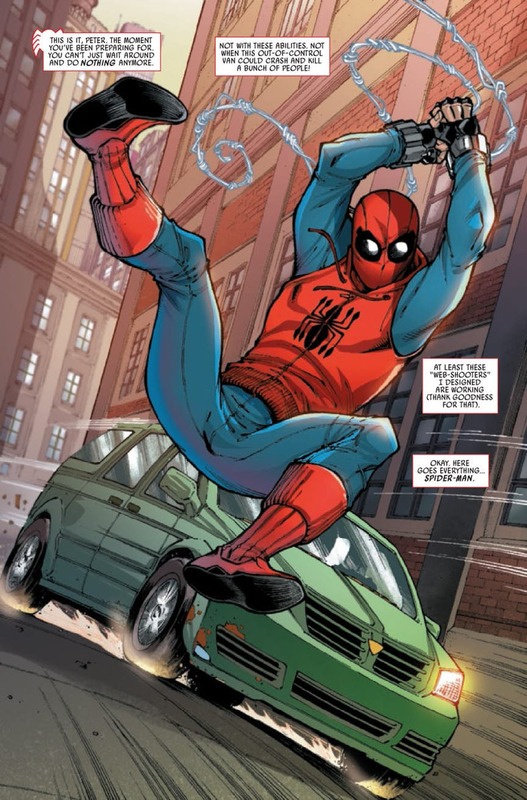 No doubt the second issue will focus on the airport scene, but I dearly hope the approach changes, and we aren’t left with so much happening in between panels; that could really sabotage the extended action sequence, and given how much that scene’s loved by fans, it would be a major problem for the Spider-Man: Homecoming Prelude comic.